There are many, many teas that have hibiscus as an ingredient. So what is hibiscus? There are more than 200 species of hibiscus flowers, which grow throughout the world in temperate, sub-tropical and tropical climates. 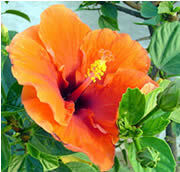 The hibiscus flower is quite large and is characterized by 5 petals. Hibiscus flowers are commonly used for landscaping, floral decorations and a whole host of other things. And, oh yeah, hibiscus commonly finds its way into tea too. Now, a word should be said here. Many, many herbal teas contain hibiscus flowers. However, you really can't taste the hibiscus either due to the type of flower used or because only "trace amounts" are used. For this reason, listed on this page are teas that I define as having a very distinct "hibiscus taste." While this taste varies depending on the flower used, one characteristic is that the tea will have a very "flowery taste" and "flowery aroma" to it. Listed on this page are links to reviews on this site for teas that either have, or should have, a hibiscus flavor to them. Just click on any of the links to read the reviews.